HD DVD was a high-resolution video format that was the initial competition for Blu-ray. 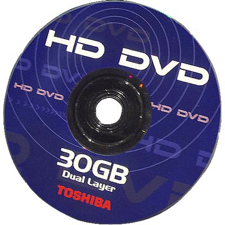 It was ostensibly backed by Toshiba, and few other notable manufacturers, as an advancement for DVD (of which they held many patents). The format war, the likes of which hadn't been seen since VHS/Beta was despised by the public and the press alike. Not willing to back down against overwhelming opposition, Toshiba appeared to be trying to harpoon the burgeoning HD disc market. The largest studio backer, Warner, announced the first day of CES 2008 that it would stop supporting HD DVD, effectively killing the format. From a technical side, there was little to differentiate the formats. Blu-ray was higher capacity (25 GB per layer, vs 15), but it was easier to convert machines to produce HD DVDs, saving studios money initially. The picture quality was technically identical, with both formats encoded at 1080p/24 for films and using similar video and audio codecs. Initial players from both formats had problems, though showed much promise. With the demise of HD DVD, Toshiba eventually started making Blu-ray players, and their current crop are inexpensive and perform quite well. Read our review of the Toshiba HD XA1 HD DVD player for a look at how good (and bad) the first HD DVD player was. Be sure to also check out our Blu-ray Player Review section for the lastest HD disc players. For even more detail, check out the HD DVD Wikipedia page.